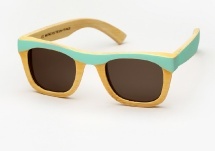 Always on the lookout for unique designers we couldn't help but be drawn to the hand-carved all wooden sunglasses of Waiting for the Sun. Handmade in Paris France each pair of sunglasses is meticulously constructed using super lightweight natural materials such as Australian tea wood, rose wood, or bamboo. Classic styles such as the wayfarer, cat-eye, P3, and even a round John Lennon esque style are given a completely different look and feel. 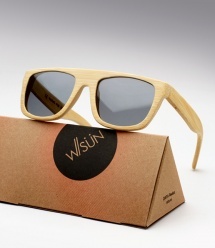 Wood offers great properties unlike any other material ---- each piece of wood has different natural veins, making each sunglass unique. Also wood changes overtime with use, from sunlight, moisture...so like a faded loved pair of jeans it only gets better with age. Other notable frame features include optical spring hinges for increased comfort and Carl Zeiss lenses which are known for their superb optics. 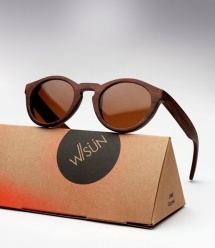 Each pair of sunglasses comes complete with a special edition 2041 cm2 artist designed scarf, as part of Waiting for the Sun's "2041 program". The 2041 program is a partnership allowing various artists from all over the world, such as Steven Harrington, Parra, PAM, and more, to design a 2041 cm2 sized scarf to protect your glasses. 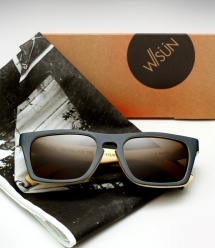 The scarf design included with each pair of sunglasses is chosen at random.